Hockey season is a short time away and I thought we should put our own team together. I am now recruiting members for TEAM GEOCACHE. Here are the details. 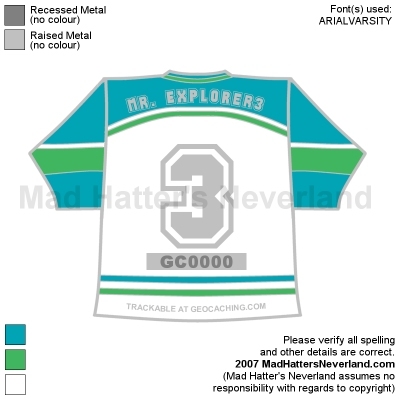 Each team member will be able to put their own NAME on the back of the jersey (geocoin) and pick their own NUMBER. The jerseys (geocoins) will come in three colors WHITE home jerseys, BLUE away jerseys, and GREEN third jerseys. Be sure you are committed to your purchase as securing a number will limit others in their choice of numbers. Only one of each number will be available so first come first served. This will be determined by the e-mail time stamp I receive when I am contacted. Please pick a first and second choice number. To be on the team each member will be required to purchase a set of 20 jerseys (geocoins). 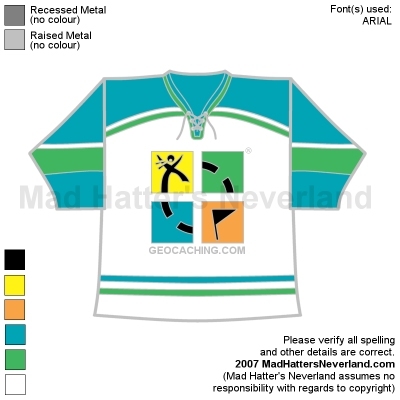 Each member will be able to get a combination of jerseys (geocoins) in home, away, and third jersey colors as they wish. I suggest something like 8 home, 8 away, and 4 third jerseys, but it is up to you. 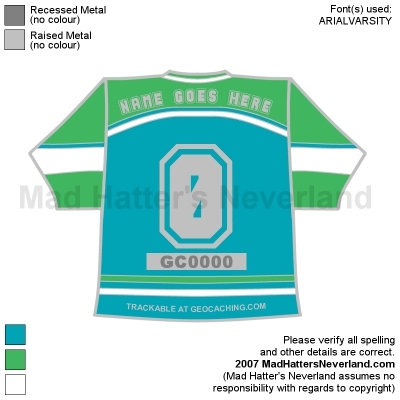 The jersey (geocoin) metals will be gold=third, silver=away, and black nickel=home. The name and number will be in the GC ORANGE color. In order to make this happen we will need at least 25 members on the team. Each member’s fees will be approximately $145.00 which will include 20 personalized jerseys (geocoins), shipping, personalization, and fees. Payment will need to be in advance of the order. Be sure you are committed to your purchase as securing a number will limit others in their choice of numbers. The jerseys (geocoins) will be trackable on geocaching.com with a unique icon. The plan is to have these finished by October 1st, just in time for the regular hockey season. All members will need to be submitted by September 7th so we can get the geocoins back by the date we want. 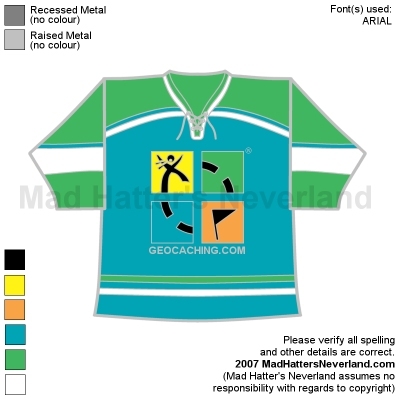 Once the final roster is set I will purchase 1 additional jersey (geocoin) of every player. This complete additional home team set will be put up for auction to raise money for my local fire departments fill the boot drive, IAFF Local 187. All profits raised will go to the MDA. I will update the team number list as often as I can so you will know what numbers are available. Please e-mail with any questions. Samples will be here in approximately 12 days. If you want to be on the team e-mail your username, real name, jersey number wanted, quantity of each jersey(minimum 20 total), address, paypal address, and please make sure it is spelled correctly. I will go by the spelling I receive. I am checking on the number of characters we will be limited to on the name. As a hockey fan (yeah, I know, living in the south, I can't be a real fan. ), I've gotta sign my life away on this one! Email sent...waiting to lace up and get on the ice! I asked for the #12. I have to add that the additional cost over the first 20 minimum will be at approximatly $5.50. I'm in. Would like #69 and the name to read TEAM EVERYWHERE. Please e-mail all information to reserve your number. Every good hockey team needs a grizzled veteran that can't skate as fast but looks downright intimidating in a playoff beard. I may have retired after I blew out my ACL (at the rink, not kidding), but I sure as H-E-double-hockey-sticks can park my phat arse in front of the net and play hell with the goalie. Sign me up. I'm #21. I'd love to get in on this...can I choose number 00? I am testing my will power and it is losing.....ugh....will hold off a bit!!! I really want to do it!!!! PM'ed you a couple of questions before I can commit to this way cool project. Gotta go for this one...how can I not resist a coin related to Canada's favourite sport. Since YemonYime claimed my #21 already, I choose #99. Awesome idea. Count me in for number 5. Please e-mail all required information to secure your number. Edited to remove one name and to add a name. ME3 - When would you need the money? I cant participate in this but I really wanted to say cool coin, great job on it! I have been fighting this as Im short on cash but gotta have a 28 jersey!! IM IN! As I stated twice in the OP please make sure you are into this project when you reserve a number, it will take someone else's choice away. All funds will be due and cleared by September 6th at the very latest. Please e-mail all required information when reserving a number. Love the coin idea. Email sent. Email sent again. Hope the number we want this time is ours, LOL! Too bad this wasn't football. I don't like Hockey much. If this was football there would be no question. I would definitley be in on a football one too. I woudn't hesitate for a minute. Okay it is football, just kidding. I can take on only one project at a time so patience may pay off. If you want to be on the team e-mail your username, real name, jersey number wanted, quantity of each jersey(minimum 20 total), address, paypal address, and please make sure it is spelled correctly. Just sent my request. Too bad I didn't notice this last night. I was really hoping to lock up #19 for Steve Yzerman. Crossing my fingers that my 2nd choice (#9 for Gordie Howe "Mr. Hockey") is still available. Email sent. I love the Pens and Jags. 68 is my favorite number for several reasons. If number 8 changes their mind me know I am!!! Mark Recchi the wrecking ball....Loved him in the early 90's and love him now!!! I would like to announce that Landsharkz will be producing this geocoin. I am excited to get this going and can't wait to see the samples. Thank you Landsharkz. Thank you to the other companies I contacted for your quotes and suggestions. I know we shouldnt be hockey fans here in the south, but I have had 4th row season tickets to the Hurricanes since they moved to Raleigh. Still a die hard football guy, but hockey is a close second, so I figured I would join the team by grabbing my goalie Cam Ward's #30. Very cool idea, I look forward to getting the coins. We've had season tickets since the 2nd year in Greensboro while they waited for the real arena in Raleigh to be built. Bounced around between sections over the years, in 102 this year. We'll have to swap coins on opening night. Cool idea. Would love to join, but am going to have to pass on it. Good luck. Right on. A Canadian company making jerseys for the Canadian game. Looking forward to these coins for the upcoming season. Small world, we are in section 103 4 rows behind the visitors box. Trading coins sounds like a plan. Email sent with our vitals! I am at work and cannot check my home e-mail until tomorrow morning. I will go by any time stamps on e-mails if there is a complication with numbers. I do not foresee a problem. Welcome to the team. WooHoo! We now have 25 members on our team. Any chance we can pick colors too? Email sent with info. Hope the first choice of number goes through! Best Regards, should be a fun project!